Welcome! We want to share with you our passion for entertainment, We love to see the smiles on children’s faces. 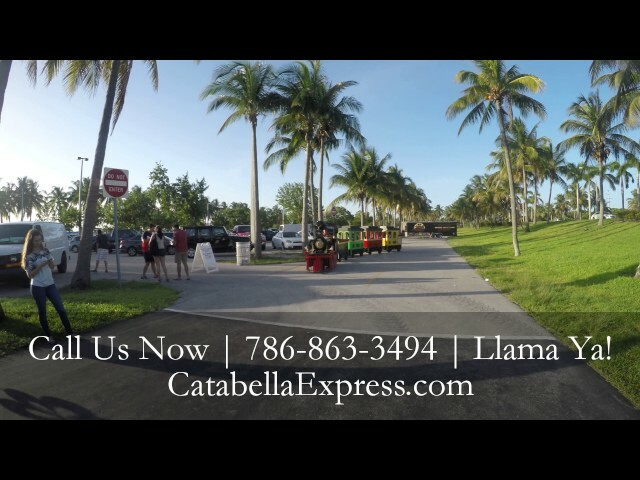 Catabella Express is a Licensed and Insured fantastic electric trackless train that recreates the authentic American 4-4-0 Locomotive, with coal cart, wagons, and caboose. We will go anywhere possible within our reach, and put our best effort to make your event totally unforgettable. 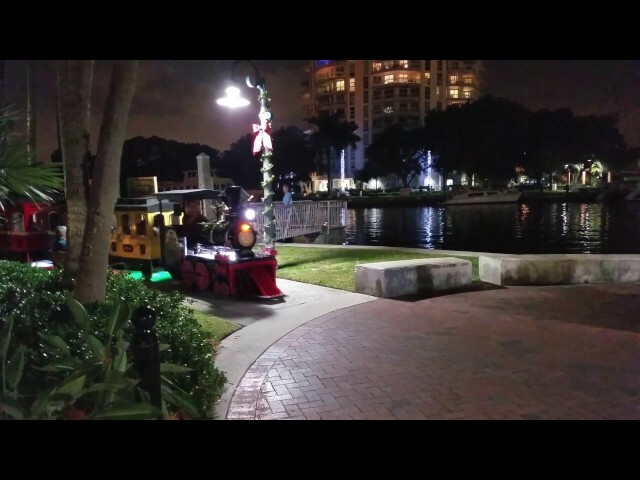 In these moments, when as parents we look for activities to have quality time in family, the possibility of offering in Miami fun for adults and children arose, going back to a magical and special time, many of us, as children dreamed of traveling in train, what a beautiful opportunity to do it than getting on the Catabella Express. We want for you to enjoy, from the first "Chu Chu" to the last stop! We are a family business, Catabella Express is for us synonymous with joy, healthy fun and togetherness. I am Carlos and with my wife Ingrid, we embarked on the incredible adventure of taking all of you to share with the whole family the spectacular experience of enjoy on board the Catabella Express. We invested in this beautiful trackless train, to be able to rent at events such as parties, schools, fundraisers, carnivals, etc. Kids love riding on the train, we think in all aspects, The Catabella Express is customized to have ADA access to be able to take children and adults with disabilities; it is also Green Technology the Train is filled with state of the art EV (Electric Vehicle) technologies thinking on a safe environment for the kids. Train is filled with state of the art EV (Electric Vehicle) technologies and is a piece of art that kids and parents can all marvel at! Our premium selection of material to build the train: Extira. Extira is a green product that is made with sustainable materials. No added Urea Formaldehyde, not subject to CARB ATCM. Extira panels are specifically designed and manufactured for exterior use. It is moisture and rot resistant. 26 passengers (Children) capacity per ride. Amount of passengers will vary depending on the Adults & Children per ride. Measures: approx. 38 feet long and 2 feet wide (locomotive, coal car, 2 wagons, and caboose). Manufactured entirely in the US with the authentic American 4-40 look. Train is handmade: hand-crafted artisan work requiring 200 man hours, The Trackless Train is Dependable, Durable and follow strict safety guidelines. Manufacturer has made these trains for SeaWorld, Busch Gardens, the Ritz Carlton, Radio City, and many more establishments around the world. We are Fully Insured with a General Liability Insurance Policy. The children’s safety is our top priority! 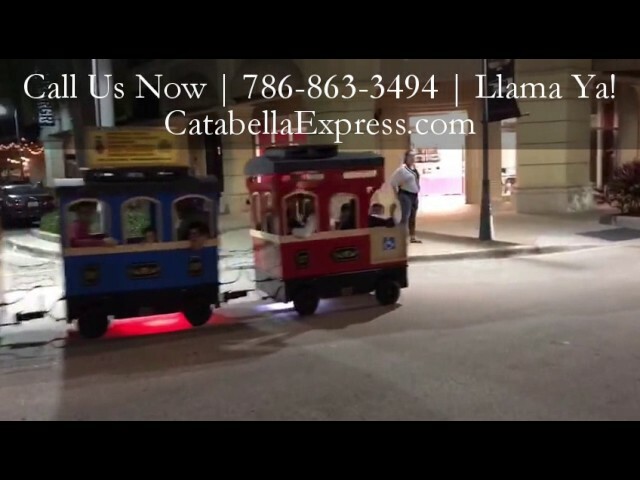 The Catabella Express Uses a top of the line sound system able to play your favorite children songs. LED lighting throughout the entire train, looks beautiful at night. The Catabella Express was made to blow out fake smoke and has an antique whistle to make it as close as possible to the real train ride experience. It’s a large unit, and we will safely delivery the unit to you at free of charge. The train will be operated by owner at ALL TIMES. Thank you for your interest in booking the Catabella Express please fill the form bellow, we will contact you as soon as possible.